Review: Melinda Marie Jette’s “At the Hearth of the Crossed Races” OSU Press, 2015. Melinda Marie Jette’s 2015 book, At the Hearth of the Crossed Races, expands upon previous historical analysis of the beginnings of the Oregon territory, the fur trade and tribal relations in Western Oregon. Jette’s premise, that there has been an “inclination to overlook the French Canadian trappers, and by extension their bicultural families and Native kin,” is well founded. This is a timely addition to the literature of the Oregon Territory. Its now a tradition, part of my culture. Perhaps five years ago I began noticing and stopping at the camas fields in Salem. 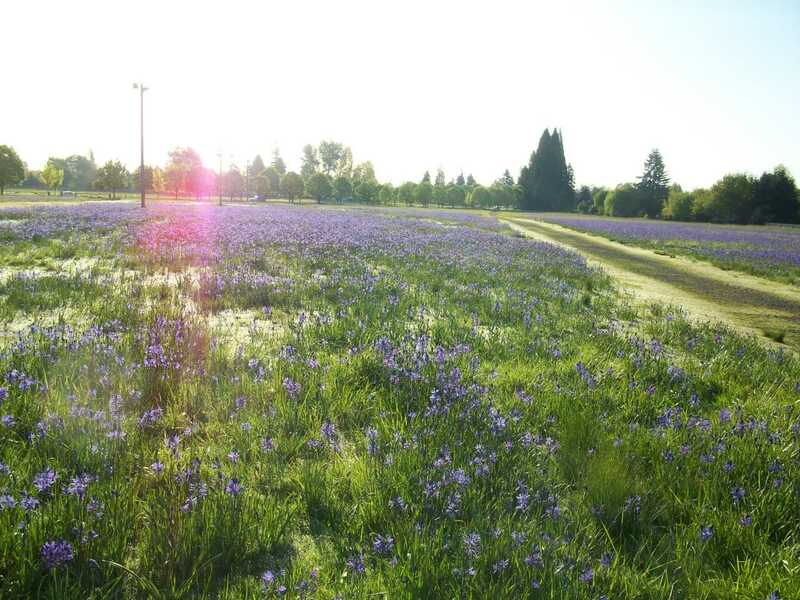 The best camas fields are those at Bush Park and at the State Fairgrounds south parking lots of Sunnyview Rd and 17th. Little did I know but Salem, formerly called Chemeketa (tcha mikiti), was the main village of the Halpam Kalapuya tribe. The people (amim), harvested many camas (ti’p) in this area. This was well known camas place for many years, and tribes would travel from all around to dig camas, and rushes for basketry. The rushes probably came from the very large Lake Labish, by Chemawa Indian school, now drained. 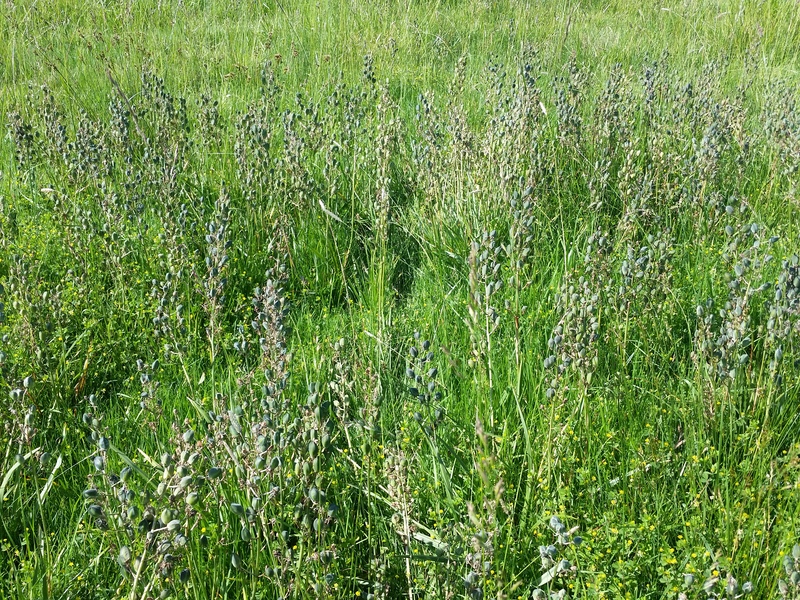 Bush Park has numerous camas fields. First they begin in the parking lot, under the oak trees on the north side. 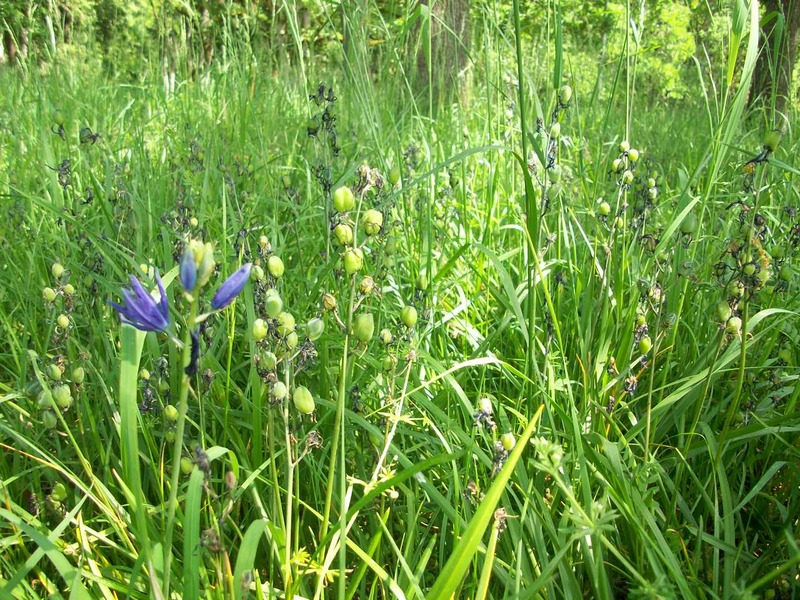 The area is very shaded and full of amazingly rich growth of Camas. There are several white camas there. 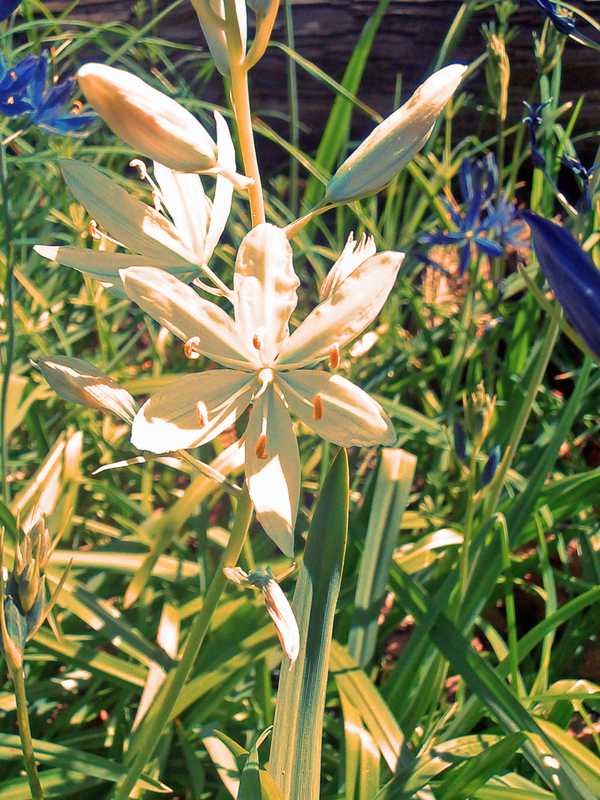 These are not Death camas but instead a white variety of true camas. 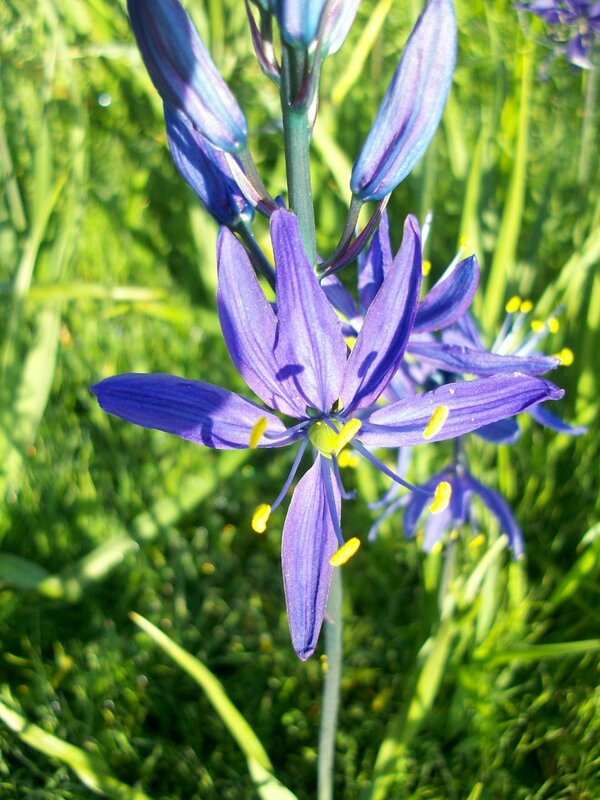 This camas is in the center isle, between the roadways and along the paths. The next field is near the baseball and tennis courts. 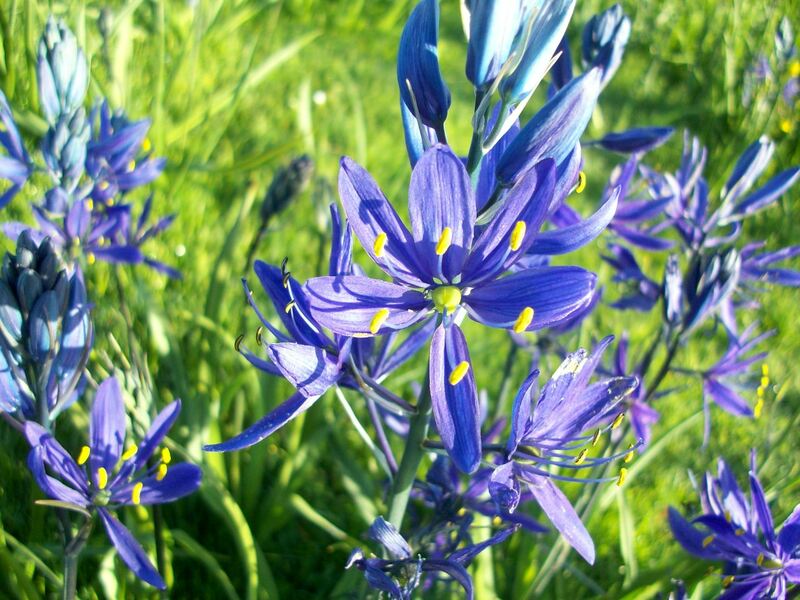 This is a very sunny area, very hot in the summer and the camas are smaller but still very many populate this large area. The last field is behind the track, up the hillside by where everyone has daily picnics. 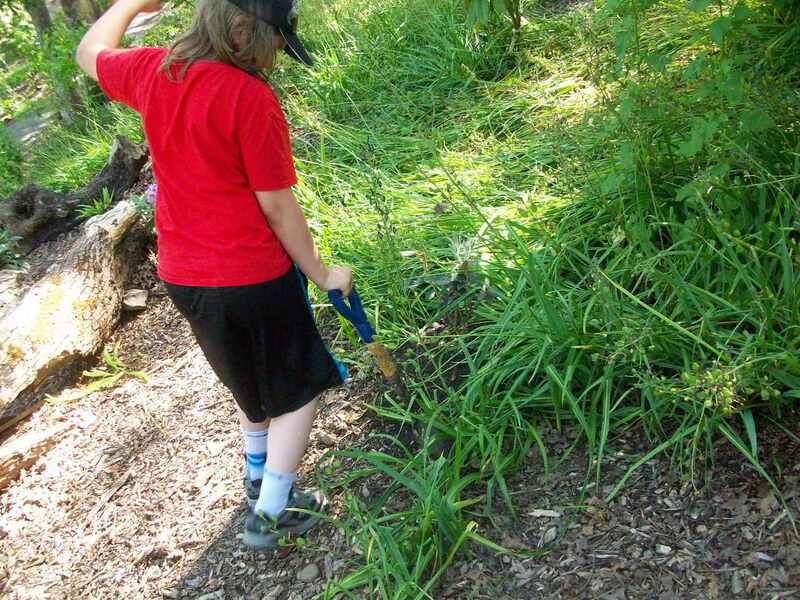 The camas here are very big, having been helped by people working to remove all of the invasive plants. 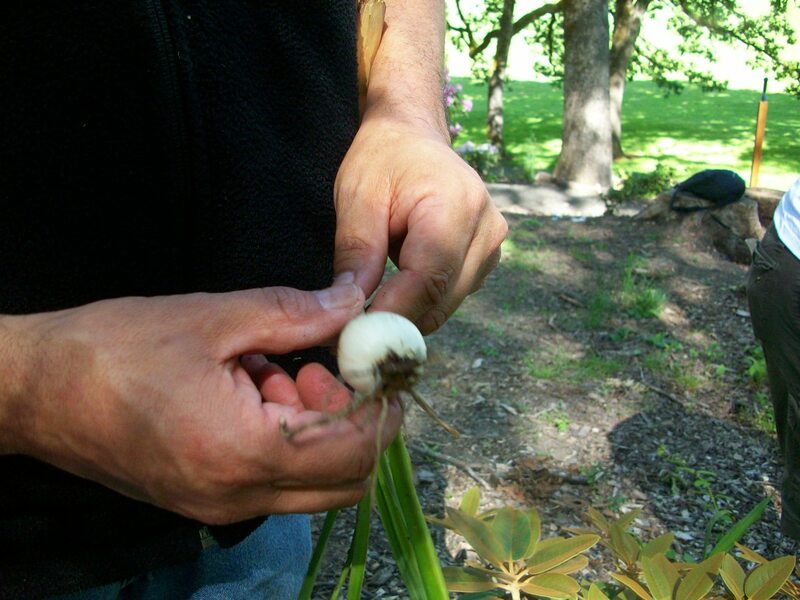 There are numerous true camas here in a white variant color. The Fairgrounds parking lots are full of camas. The south lot has the most, so many that it looks like a sea of camas. 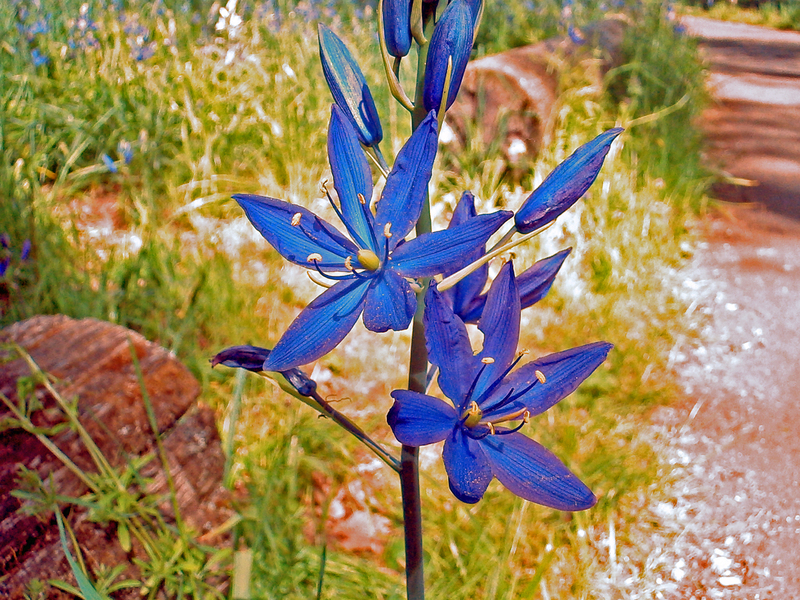 There are walking trails through this area and there is a rare varieties of blue camas with blue streaky petals. I have not seen other large areas of camas around Salem. The next fields I notice are on the freeway within the grassy areas. One interesting fact about the flowers, is that they are not a perfect star shape, but one petal is faced in the general direction of the ground, while the other five are tipped upward. I have heard this is a trait to help bees orient themselves when they are visiting the flower for pollen collection. 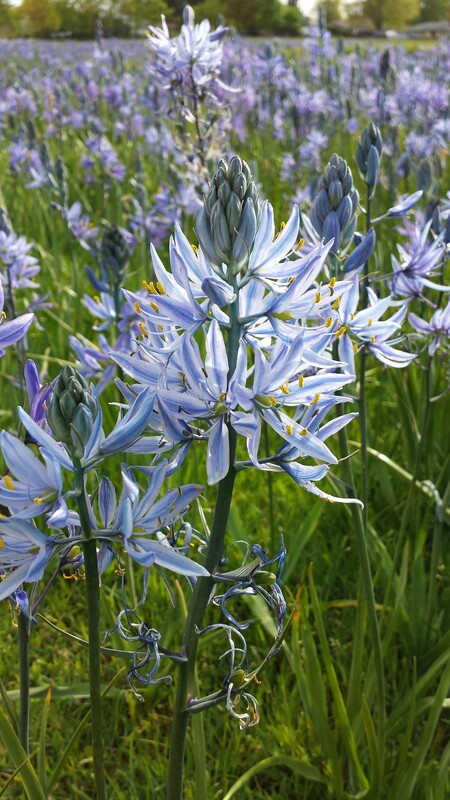 The details of the Camas flower should be noted by artists, as the perfectly equilateral flowers seen in many images of the camas is not always accurate. That’s it for my camas obsession for this year. I leave you with some camas now going to seed at Bush Park. I also began collecting seed this year and have seeded my native garden at home. Tribal traditions, languages, ethnography are integral to research on the cultures of tribes. These are part the libraries of tribal knowledge that are somewhat preserves and lost over the past 200 or more years. Elders have stated that whenever an elder passes, a library is gone. This is especially true for people how are carriers of tribal traditional knowledge, where they are no others who possess the language or stories of the tribe. This event, or series of events has been happened for hundreds of years, and the colonizing processes that are now taking over all human cultures are expanding. In the 19th and 20th centuries ethnographers following a notion of Salvage Anthropology collected millions of pages of indigenous intellectual knowledge. Ethnographers undertook this work thinking that tribal cultures were disappearing and someday their languages and cultures would not longer exist. This seeming disappearance of tribal culture was happening at the same time as the United States, Canadian, and Australian governments were pursuing aggressive education campaigns, forcing indigenous children into boarding school to assimilate them, by eliminating the languages, and cultures. This forced assimilation continued in the U.S. well into the 1970s. Then In the U.S. was passed the Dawes Act forcing less-than 1/2 Indian blood people to leave the reservations as they could not get on-reservation allotments. This further eroded the cultural base for many tribes. 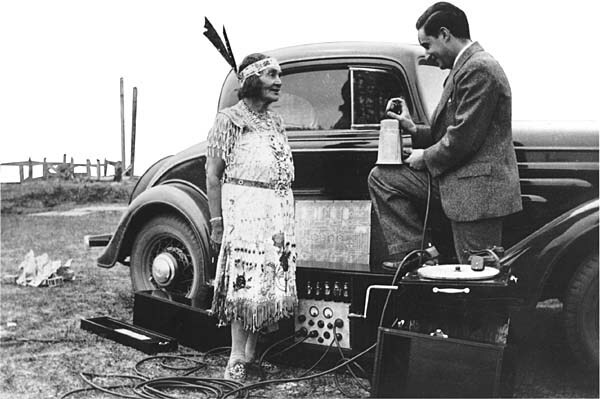 From the 1940s to the present day, much of the intellectual knowledge recorded from native people in the U.S. has never been returned to the tribes. Tribal people had few scholars and thus limited access to where their ethnographic collections were kept. Much of the studies at the time were about language, but there were many studies of culture in the later years. The tribal cultures continued to erode away, with a loss of populations, or out-migration, and then termination of many tribes in the 1950s. The culmination of so much degradation on tribal culture and knowledge caused many tribes to cease to exist. Everything began changing int he 1970, indigenous peoples began fighting back. There are many examples of cultural revival that began then, Maori, Hawaiian, some Native American cultures, are the most prominent. There are now additional efforts to bring back tribal knowledge. Some work happening in archives of the United States by local Oregon tribes (Coquelle and allies) in the 1990s has brought back field notes of numerous ethnographers to the tribes. Previously I have written about the SWORP Project and Collection, which is the most prominent effort in the area to return traditional knowledge to the tribes (some chapters and articles about this project are publicly available). What made the project possible was the way in which the collections of the BAE, now the National Anthropological Archives, are considered to be publicly owned documents. As such they are subject to collection, copying by the public, which made their return to Oregon a fairly simple process. The research and copying was time intensive, but there were few hurdles once the documents were copied. In addition, many people (archivists, directors, scholars) working in the Smithsonian and National Archives were very sympathetic to the tribal issues. Now so with some other collections. The Melville Jacobs Collection at University of Washington for some 30 years was heavily managed by a committee where researchers had to request access, request copy rights and request publication rights. The collection is now open, but for some 30 years, they were some serious hurdles to accessing the collection. Similar statements from Melville Jacobs about John B. (Mose) Hudson and Eustace Howard were made. Melville noted that Eustace knew more of the culture of the Santiams, while Mose knew better the languages of the Santiams. 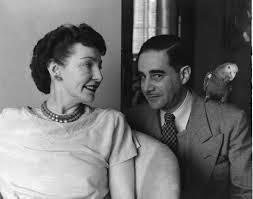 Both of these informants worked for years, in the 1920s-1930s with Melville to tell their stories, and to accurately translate them. In fact these tribal informants spent much time traveling to Seattle for weeks at a a time in working on these notes. And while they were likely reimbursed for their time, they were very intent to get the information right, as without them, this work would not have been possible. And if not for this, there would not now be an opportunity for the descendants to learn these stories. I believe that these intelligent leaders in their community knew what they were doing and made a choice to save their knowledge rather than let it pass forever. The question then is save it for what? And the answer is they knew that someday their descendants would be reading these stories again. Yet, ironically, these collections of fieldnotes were kept in a limited access collection for so many years at UW. This is the nature of some academic institutions, and such limitations to tribal peoples seeking to recover or restore a working knowledge of their culture is unacceptable. This is how I felt about the collection when I first heard about it some 20 years ago. Now the collection is open and available. I wonder how the limitations to the collection slowed down research on our tribal traditions, and hamstrung our ability to recover faster. Did the management of the collection adhere to the wishes of the informants, this is a key question. There are lots of issues at play here. In tribes stories are owned by the tellers, but once they are told to scholars they seemingly become the property of the scholar or university if the collection is housed there. This seems a poor arrangement for native people. Moving forward, there needs to be free access granted to the subject cultures, and more of a partnership arrangement between the tribes and the universities. This would hopefully correct many of these issues when they arise. There are additional issues in the collection, interpretation, and authenticity of the fieldnotes wherever they exist, but that is for another time.